As Curiosity moves across the dust-shrewn dune-filled flats at the base of Mt. Sharp it has recently taken images of surface rocks that have cracks resembling those found from drying mud. Scientists used NASA’s Curiosity Mars rover in recent weeks to examine slabs of rock cross-hatched with shallow ridges that likely originated as cracks in drying mud. 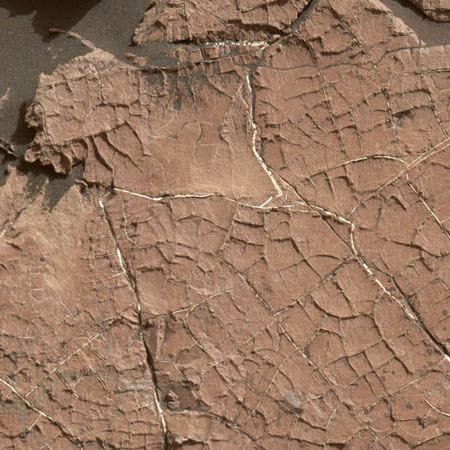 “Mud cracks are the most likely scenario here,” said Curiosity science team member Nathan Stein. He is a graduate student at Caltech in Pasadena, California, who led the investigation of a site called “Old Soaker,” on lower Mount Sharp, Mars. The rover is no longer on the floor the crater, but in the foothills at the base of Mt. Sharp. Thus, what we are likely looking at is evidence of the slow disappearance of the giant lake that scientists think once filled Gale Crater. These mud cracks suggest that the rover is now moving up out of the lake and through its margins. I plan to do a rover update for both Curiosity and Opportunity tomorrow, so stay tuned.